The future of nanotechnology is completely uncharted territory. It is almost impossible to predict everything that nanoscience will bring to the world considering that this is such a young science. There is the possibility that the future of nanotechnology is very bright, that this will be the one science of the future that no other science can live without. There is also a chance that this is the science that will make the world highly uncomfortable with the potential power to transform the world. Even positive changes can make world leaders and citizens alike very nervous. One of the top concerns regarding the future of nanoscience includes molecular manufacturing, which would be the ability to bring materials to life from the simple molecular reconstruction of everyday objects. This technology could end world hunger. At the same time, this process could lead to experimental molecular manufacturing with live beings. The future of nanotechnology could improve the outlook for medical patients with serious illnesses or injuries. Physicians could theoretically study nano surgery and be able to attack illness and injury at the molecular level. This, of course, could eradicate cancer as the surgical procedures would be done on the cellular base. Cancer cells would be identified, removed, and the surgical implantation of healthy cells would soon follow. Moreover, there would be an entire nano surgical field to help cure everything from natural aging to diabetes to bone spurs. There would be almost nothing that couldn’t be repaired (eventually) with the introduction of nano surgery. While this sounds like a promising future, the natural process of life and death would be completely interrupted. Without death, the world would become overpopulated and leave no place for the ecosystems that we rely on for our survival. We could potentially end up in a world that requires the personally controlled delivery of oxygen through tanks and masks. 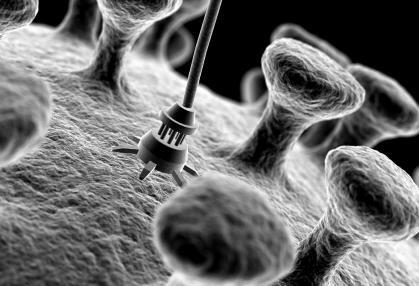 The future of nanotechnology could very well include the use of nanorobotics. These nanorobots have the potential to take on human tasks as well as tasks that humans could never complete. The rebuilding of the depleted ozone layer could potentially be able to be performed. Nanorobots could single out molecules of water contaminants. We could put these tony robots to use keeping the environment cleaner than ever since they could break it down to each atom of water pollution. These nanorobots could also take over human jobs, especially those in high tech positions. If we wipe out too many human high paying, high tech positions then we threatened the world economy. The future of nanotechnology rests in the hands of the current scientists that are ready and able to help guide this very young science into the next realm. There are those who fear the future of nanoscience and there are those who are ready to embrace it. Walking a careful line in cohesive junction with human interests is going to be a tricky but worthwhile accomplishment. There is a possibility that the future of nanotechnology could also be the end of the science. There is a great burden on the scientists of nanotechnology. These men and women have to be able to keep the progress in play while keeping the interest in nanotechnology alive despite the potential limitations. Nanotechnology is already quietly expected within the scientific community to be the answer to the world’s problems. Just like the previous answer to the world’s problems the human element cannot be factored in until the future becomes the present. Much of the funding for nano—research may very well require something amazing in order to continue. The funding that keeps nanotechnology alive is invested in the potential future progress that this technology promises. If it fails to deliver at least some of the potential, funding and interest might vanish right before the eyes of the scientists who spend their lives trying to increase life’s wonders through the manipulation of atoms and molecules. This entry was posted on June 15, 2009, 9:24 am and is filed under nanotechnology. You can follow any responses to this entry through RSS 2.0. You can leave a response, or trackback from your own site. This is a really good article and nano science is very interesting.